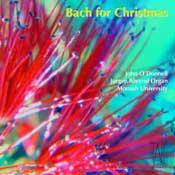 For the first time: all of Bach’s organ music for Christmas on a single CD, the programme chosen and performed by Australia’s John O’Donnell, a world-renowned Bach specialist. From the festive Pièce d’Orgue to the charming Pastorella, from the popular In dulci jubilo to the esoteric Canonic Variations, from the gentle Puer natus in Bethlehem to the powerful Christum wir sollen loben schon. Celebrate this Christmas with Bach! Consistently inventive, colourful and, even more to the point, enjoyable, this disc handily collates all Bach’s Christmas music on a single CD. There are caveats; as John O’Donnell admits not all these pieces were necessarily written for the divine services and the opener, the Pièce d’Orgue (BWV 572) is a case in point, even though it’s clearly festive and employs the same material as Bach used in one movement from his Christmas Oratorio. And the Pastorella makes it by virtue of being a Christmas genre, though it seems to have had no known liturgical connection. Such details aside one can but admire O’Donnell’s sensitivity, technical address and consistently thoughtful choice of registrations. Everything is alive and apt and the programme is adroitly chosen, divided into groups in partial emulation of the kind of service at which Bach would have played – opening with a prelude and ending with a fantasia or fugue and in between chorale based works. Here therefore we have five different and consecutive settings of Vom Himmel hoch da komm ich her each of them independent and imbued with its own distinctive sound world and response. The contrasting settings of In dulci jubilo and Lobt Gott, ihr Christen, allzugleich embody the same qualities and differences. I was particularly taken by the fughetta for manuals in Vom Himmel hoch da komm ich her, BWV 701, and the fifth of the settings here, the great Canonic Variations, where the fluidity of the music is matched by the mellow 4’ Spitzflöte and oboe. O’Donnell chooses registrations with great textual ear – and it’s good that he ensures that they are printed in the booklet where one can, if one wishes, follow him at work. The four-movement Pastorella is another of the highlights, full of springy textures, where O’Donnell proves light and aerated, as indeed elsewhere – the first setting of Lobt Gott, ihr Christen, allzugleich, for instance – he shows himself powerfully in command of the more dramatic and leonine aspects of the music. Sound is warm and mellow and the Jürgen Ahrend organ proves a most adaptable instrument – and this seasonal conspectus proves equally to be a winning collection. Here are settings of chorales for the Christmas season. There are many settings of some: five of 'Vom Himmel Hoch', three of 'Gelobet Seist Du', two of several others. Added on are the Pastorale and (for no really good reason) the Fantasy in G, here designated Piece d'Orgue. John O'Donnell Is University Organist at Monash University in Melbourne. The instrument there is a fairly large 1980 organ by Jürgen Ahrend, It is quite good for baroque music; the upper work is very prominent and the reeds are buzzy. O'Donnell displays the organ's range of color to good effect. He uses a wide variety of registrations and, much to my taste, plays Bach with lots of muscle…. This is a fine release, but it won't suggest Christmas to anyone not versed in German chorales. The recording is excellent-very clear with little reverberation-and the liner notes include registrations for each piece. John O'Donnell presents an impressive display for his group of chorale preludes and the Piece d'Orgue [listen -- track 1, 0:00-1:23] on a well-chosen neo-classic instrument -- a 1980 Ahrend organ. Nearly thirty shortish pieces are a challenge to play with the qualities that reveal the tiny kernel of each. Bach can be played at times with a reverential awe that tends to choke the wonder of his creative power. But there is no trace of it here[listen -- track 11, 1:07-2:10]. If you are set on having, as the disc's promotional material claims, "all of Bach's organ music for Christmas on a single CD," then this new recording from organist John O'Donnell and Australian label Tall Poppies is a solid choice. Of course, not everything here is provably Christmas music--the disc opens with the well-known Pièce d'Orgue BWV 572 (also known as Fantasia in G) and later includes the Pastorella BWV 590--however, O'Donnell offers his own justifications (the former's middle section shares a theme with a chorus from the Christmas Oratorio; the pastorella as a genre "belongs" to Christmas)--and who will complain about the presence of these fine works, especially when played as well as they are here? O'Donnell also argues for the authenticity of Wie schön leuchtet der Morgenstern even though it's "been omitted from the Neue Bach-Ausgabe." What we end up with is a full-length program (nearly 74 minutes) that offers 24 works organized in groups according to the thematic material--that is, multiple settings of a particular chorale are grouped together. In this way we become immediately aware not only of how different each version is from the last, but how inventive O'Donnell is in his registrations. For example, the contrasting character Bach built into his two settings of In dulci jubilo is embodied in O'Donnell's choice of a simple, mellow-voiced registration for BWV 608 and a grand, full, brilliant sound for BWV 729. A highlight has to be O'Donnell's performances of the five settings of Vom Himmel hoch da komm ich her, concluding with a commanding rendition of the monumental Canonic Variations BWV 769 in which he masterfully builds and progressively alters the registrations to match the 12-minute work's changes in texture and complexity. Although O'Donnell doesn't resort to any strikingly unusual choices of stops, he does create a beautiful and decidedly pastoral atmosphere through the four movements of the Pastorella, imaginatively employing flutes and reeds--and even the (often-dreaded) Vox humana, concluding with a bright, happy, dancing fugal section. I really enjoyed O'Donnell's colorful yet always tasteful use of reed stops throughout, and the dramatic introduction of the 8' pedal Trompete and Nasat stops in the final minutes of the Canonic Variations. O'Donnell's technique is fluid and assured, and his registrations consistently give clarity and individuality to each separate voice, just as Bach himself reportedly achieved in his own playing. His instrument is the 1980 Jürgen Ahrend Organ at Melbourne's Monash University, and O'Donnell shows it to be characterized by a generally bright sound that can produce both powerful and more gentle utterances, especially interesting when carefully flavored with the assertive reeds and mellifluous flutes. The sound is properly spacious yet just dry enough to preserve detail of inner lines and the quality of the multitude of timbres. Highly recommended. John O’Donnell is a recognized scholar, an Australian, who has specialized in baroque keyboard music. He claims to be the "first person ever to perform Bach’s complete keyboard music in public", but Helmut Walcha did that during the war years. There are some fine things about this. The organist is impressive in his secure, polished technique, rhythm, and judicious choice of tempos. The organ by Jurgen Ahrend at Monash University (1980) has a cohesive, musical sound – a clear pleno, superb reeds, an excellent pedal division – and this in a dry, unfor­ giving room – a real tribute to the builder. Moreover, the collection forms a very nice program of Bach’s Christmas organ music, grouping the chorale preludes, primarily the smaller settings, by their titles.